At first, I was mad at Hot Doug’s. It was Saturday night and after a few days in Chicago, I was looking forward to the next day for what I expected to be one of the highlights of the trip – a chance to try a creation from the famed Hot Doug’s. So there we were in the cab on Saturday night, planning the next morning and afternoon, which happened to be my last day in town, when a slight look of panic struck my host. “Um, I have some bad news,” she says, looking up from her phone. Not knowing where she was going, I looked back in wonderment. “Hot Doug’s is closed on Sundays.” Devastation set in. What? I get that everyone needs a break, believe me, but such an iconic spot closed on a Sunday? One that wasn’t even in downtown and is only open until 4 p.m. during the week, leaving limited Hot Doug trip options? Total bummer. But not one to dwell on the negative, we quickly devised a plan b for hot dogs – Superdawg. Even more iconic than Hot Doug’s and another Travel Channel Hot Dog Paradise darling, Superdawg was a better choice, and one I should have thought of earlier. While I love one Mr. Anthony Bourdain, my taste preferences are probably the exact opposite of his, and following his trip to Hot Doug’s, I should have known I was more of a Superdawg lady anyway. 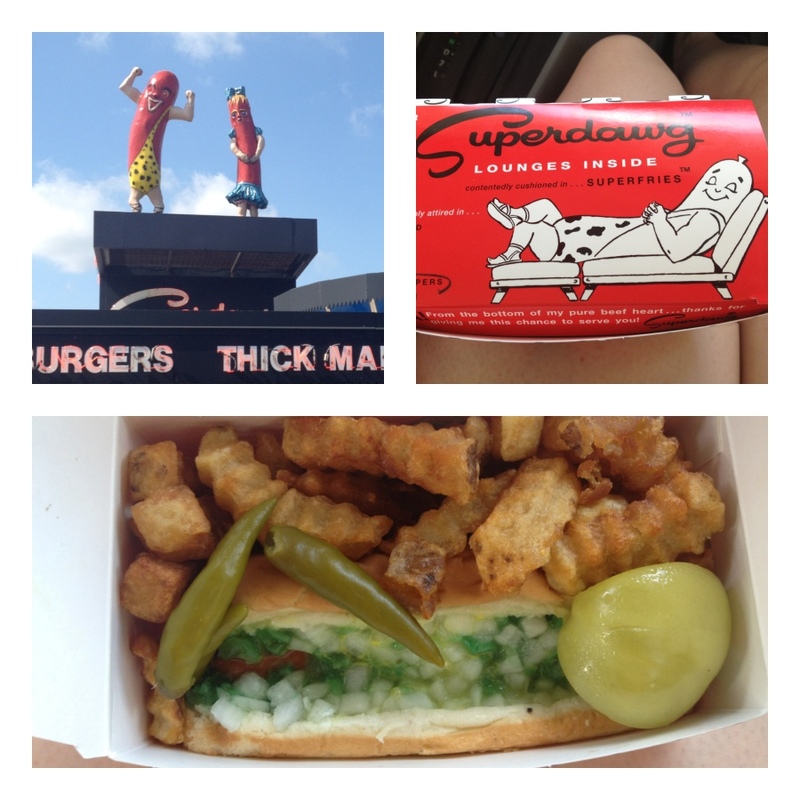 And Superdawg didn’t disappoint – from the drive-in style and getting to order at one of those old-timey speaker stands and the delicious fries and straightforward options, I knew it was the right choice. I ordered the classic Superdawg meal with fries, and as good as I’m sure Hot Doug’s would have been, Superdawg was the perfect way to end the trip. “Not a wiener – not a frankfurter – not a red hot – but our exclusive… Superdawg™”, it was definitely a hot dog I could appreciate. A little campy and a bit more of a Chicago institution, Superdawg was a lot of fun and no pretentiousness – a rare combo for San Francisco and a nice bonus while traveling. Plus it is open late, and I usually need hot dogs during evening hours as well as for lunch, so another point for Superdawg. While Superdawg is also outside of downtown, I would highly recommend making the trip, even if Hot Doug’s is open. Although the next trip will definitely include more time on Saturday afternoon for a trip to HD’s. By then my anger might have subsided, but my need for Chicago-style hot dogs will be as strong as ever.